One of my favorite new pastimes is harvesting wild edibles. It’s so much fun being out in nature gathering nutrient dense, delicious wild food, for free! Dandelion is at the top of my favorite things to harvest list. It’s loaded with nutrition and the whole plant can be used as food and medicine. It’s no longer a pesky weed in my book. We all know how important green leafy veggies are for our health. Consuming ample amounts each day can be a challenge. What I love about wild edibles is that a little goes a long way. Let me explain. Wild plants are more nutrient dense (contain more vitamins, minerals, and antioxidants) than commercially grown produce, even local and organic. This higher amount of nutrients is precisely what allows wild plants to survive without someone looking after them, such as a farmer. Because wild plants are so nutrient rich, you don’t need to consume heaping amounts, also reducing your caloric intake – win-win! Ralph Waldo Emerson once said that a weed is simply a plant whose virtues we haven’t yet discovered. I think everyone has weeds right outside their door that apply. Another wild green I love is lamb’s quarters, often referred to as spinach on steroids. For specifics on the nutrient profile of dandelion and why it’s so health promoting, click here. A word of caution, don’t go picking any old weed and tossing it into you blender. Find an expert and read a book or two, then forage away. If you’re really sensitive to, or dislike bitter tasting foods, use half the amount of dandelion this recipe calls. Enjoy! 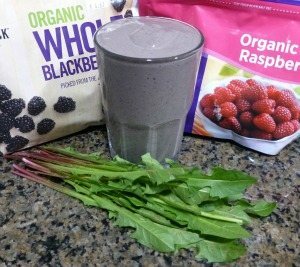 I’d love to know what you think or if you tried this dandelion berry smoothie – please do tell in the comments below. Happy Blending! Just read that wild dandelions have seven times more phytonutrients than spinach! I’m always a little weary of dandelion smoothies because they can be a tad bitter for some people. Glad you liked it, Erica. Dandelion greens are also delicious with watermelon. In northern Virginia, some Harris Teeter supermarkets sell them. We should all ask for them at our local markets. Thanks for this recipe! Dandelion greens and watermelon – I’ll have to try that combo, sounds yummy. Dandelion greens should be sold right along with spinach, kale, and other greens. They’re a supergreen! There is a method to my madness :) I find most people, myself included for a long time, don’t get enough healthy fat in their diet. Coconut oil is the perfect fat for smoothies to remedy that, and it helps slow down the absorption of sugar. This recipe doesn’t call for too much sugary fruit, but many do. I need to work on making this more prominent on my site. I recommend experimenting with a variety of recipes and developing a few go-to smoothies. I typically have two or three staple recipes to choose from to make each day. I like to experiment with a new recipe once a week. This takes the guess work out of what’s going into your blender and allows you to easily have the necessary ingredients on hand. My go-to smoothies evolve as my health goals shift and yours should too. I did go ahead and try this recipe, as written (except I went extra heavy on the dandy greens and cinnamon), and it was awesome! It reminded me of a million times more delicious and nutritious version of Tazo’s Brambleberry tea. Many thanks! You’re welcome, Niko. Coconut oil is great for cooking because of its high smoke point as you alluded to, but also great to consume. For someone as active as you I’d think it would perfect because the medium chain fats are used almost exclusively to produce energy.